Discovered by Amerigo Vespucci for Spain in 1499, the Spanish did not stay, being disappointed at finding no gold. It was first settled by the British in 1650. These settlements were invaded by the Dutch, and in 1667, the Netherlands obtained control of Surinam, then Guiana under the Treaty of Breda, in exchange for their North American claims to New Amsterdam, now New York. When Napoleonic France occupied the Netherlands, Suriname was occupied briefly by the British from 1799 to 1816. Suriname gained independence on November 25th 1975. Political instability followed and the military took over the government in 1980, and killed 15 opposition members in 1982. Democracy was restored in 1987, but the army again took control in 1990. Democracy again resurfaced in 1991, and the Dutch government has since assisted Suriname's financial stability. The original population were the Arawak tribe, partially replaced by the Caribs. Slave labour was imported by the Dutch until 1863, originally from Africa, but later Chinese workers were imported from Indonesia, and Indians until 1916. This has left Suriname with a rich ethnic mixture in its population. The official language remains Dutch, but Tongo, Javanese, and Sranan or Sranang are widely spoken as well as others. Sranan is a mixed language which arose around 1700, and is widely used in everyday situations. 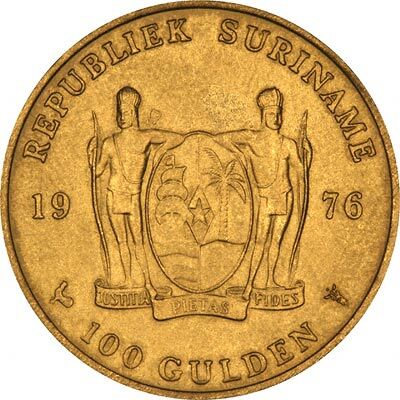 Suriname still uses guilders (gulden), inherited from its Dutch history. We occasionally have a small selection of Suriname gold coins in stock. We show the specifications here of the most frequently held coins, followed by a list of coins most recently available. 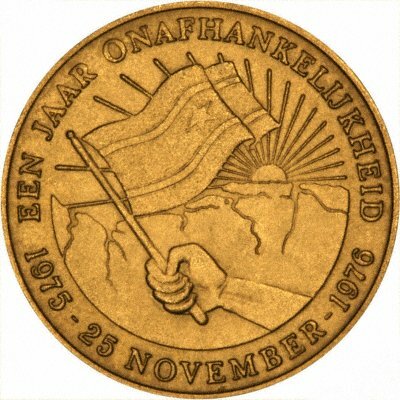 Technical specifications of the most frequently encountered Suriname gold coins. The 1991 250 Guilders shown has the almost universal coat of arms of Suriname as on almost all Suriname's coins. the value 250G, and date 1991. The 1976 issue commemorates the first anniversary of independence. We make an active market in almost all world coins, gold or otherwise, including Surinam gold coins. If you have any of these coins to sell, please contact us, or post them to us for appraisal and offer.